No plans for the weekend? No worries! As always, we’ve compiled the best free things to do in London this Friday, Saturday and Sunday. 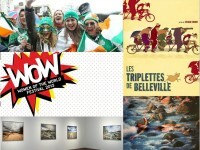 From free festivals to art exhibitions we’ve picked the best events of the weekend 11-13 March. So, have a look below to find our top picks, and if the top 5 isn’t enough you should also check out the top 10 free things to do in town in March, the best free gigs and the best free film screenings. Les Triplettes de Belleville is a seminal piece of animation with live music soundtrack from Cabinet of Living Cinema. Experts in many fields, including art, journalism and science and WOW festival speakers provide free mentoring sessions to women (prebook). Large-scale photographic works of the American West by the artist duo Boyd & Evans. Head to Trafalgar Square to celebrate all things Irish, marching bands, live music and one huge party. An interesting exhibition of the work of British photographer Jo Spence produced in the last two years of her life before her death.